What is a ritual? The dictionary defines a ritual as ‘a religious or solemn ceremony consisting of a series of actions performed according to a prescribed order.’ I don’t know about you, I struggle with this… Maybe it’s because I live by the adage that there are no rules – I’ve always been a rebellious soul; maybe it’s because I am such a strong believer in discernment (more of that later). As you may or may not be aware we experience a complete moon cycle approximately every 29.5 days and a Full Moon, although often associated with the night sky, can occur anytime of the day or night. Tomorrow’s Full Moon for example will occur at 5.07am here in the UK. The Full Moon is traditionally associated with letting go; with recognising what no longer serves us and moving on. So it’s a great time to ask yourself what you no longer want in your life. You then need to recognise whether you are ready and willing to let it go. If so, now’s a perfect time. 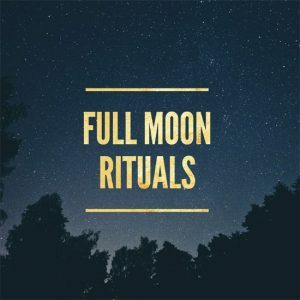 To harness the power of the Full Moon in this process simply write down what it is that you are now ready to let go – it could be absolutely anything – old thought patterns, behaviours, people, situations and go outside tonight and symbolically burn that list and release it to the heavens above. If you feel drawn to rant and shout as you release old hurts, patterns, behaviours and situations then do! Allow your primal instincts to take over. So we’ve now released stuff. What is important is to replace the space created by something positive. The simplest way we can do this is to recognise what we are already grateful for in our lives. The more we are grateful for what we already have, the more blessings we will attract to us. It is simply the law of attraction in motion. So allow yourself to connect with the good stuff – what is working for you – and you will naturally draw more towards you. You may wish to do this through meditation, quiet contemplation, writing another list, sharing with a close friend or partner. Whatever you are most comfortable with. The New Moon is traditionally associated with setting intentions. However, any time when the natural world and the Universe come in to alignment adds to the power of what we are doing. And as with anything, if we are aware of it and choose to engage with it, the effects are very powerful indeed. So if you feel guided to do some Full Moon wishing go ahead. So keep it simple Release, Replace and Refocus on your desires and intentions. This Full Moon tomorrow moves in to the sign of Capricorn (my sign)! It will focus our attention on the relationships in our lives – including our relationship with ourselves. So it’s a great time to examine the relationships in your life – what’s working and what’s not. Is it time to let someone go and move on? Is it time for new relationships in your life? You know the answers. As always practice your own discernment. In other words listen to your own inner truth. Your own inner guidance system. Your intuition. The whisperings of your soul. If it feels right you will know. Trust yourself to do what is right for you, right now. Not that very long ago we would have all been much more aware of the cycles of the moon and our interaction with nature in general. We are now seeing a resurgence of interest in the natural world and our connection to it which in turn helps us to relate to and connect with our place in the universe. So if you feel drawn to explore the magic of the Full Moon in all her glory, tonight’s a perfect night to make a start.